Now we’re in the thick of it—Aurora could be a heavy-hitter on the 2016 awards circuit. Robinson has a staggering number of past Hugo (14!) and Nebula (12!) nominations, and he’s won the Hugo Best Novel twice (Green Mars, Blue Mars) and the Nebula Best Novel another two times (Red Mars, 2312). That’s as a good a Hugo/Nebula profile as any living author with the exception of Connie Willis, who has an insane 24 Hugo noms/11 Hugo wins and 15 Nebula noms/7 Nebula wins. The conclusion: don’t bet against Willis. Back to Robinson. Aurora is also the big prototypical SF novel that voters have gravitated towards in the past: a multi-generational ship launches towards a distant star, trying to colonize a new planet in the wake of Earth’s overpopulation. When they arrive, they face unforeseen circumstances . 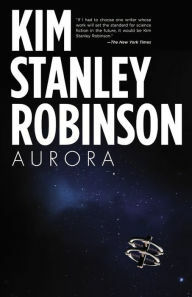 . .
It’s hard to say much more without spoiling the novel, but Robinson takes us on a profound journey through ideas of space colonization, individual and group decision making, the value of the individual life, ship design, A.I., and all the kind of BIG IDEAS you’d expect in a novel like this. Robinson gives these familiar ideas a new and effective spin, and I think almost anyone interested in classic SF is going to find something of value in Aurora. It’s a surprising and provocative novel, forcing us to think about space colonization in new ways. It’s easy to read Aurora as Robinson looking back on his own 1990s defining Mars series, which had an optimistic spin on grand-scale terraforming. Aurora is far more measured with those ideas, and this book makes a great companion piece to his earlier work or even to a novel like Seveneves, which has surprisingly similar themes. To be fair, Robinson and Stephenson go in almost completely opposite directions in these two books, but I think the cross-talk between the novels enhances both. What does this mean for the awards in 2016? The last time KSR published a true SF novel (2312), he grabbed a Hugo nom and won the Nebula in 2013. How much has changed since then? In the Nebula, not a lot—the same core of SFWA voters are still voting, so I expect this to show up on the Nebula ballot. Given that he just won three years ago, I don’t think he’ll win again, but we’ll have to wait and see. First published July 17, 2015. I couldn’t find a blog for KSR; he doesn’t seem to do much social media. Instead, here’s a list of his 10 favorite SF novels. Words like “top of his game” show up in these reviews; Adam Roberts calls it “the best generation starship novel I have ever read” in The Guardian. High praise from the mainstream for this book, and a good range of coverage to boot. That’s as positive a group of reviews as you’re likely to see from the SFF world. All identified the book as “vintage” KSR, speaking very highly of the ideas and execution of the novel. It was interesting to see how he was positioned as a “literary” SF author. I expect these glowing reviews to translate to a strong position on year-end lists, which can definitely drive awards. It’s always interesting to see what happens when actual readers get their hands on the book. Aurora is full of some very unusual philosophical and political twists, and a couple reviewers took issue with these politics, and I expect—once people finally get deeper into the ideas of Aurora—-that it will prove a little divisive. That won’t matter in terms of nominations, which are driven by passionate fans. Plenty of my fellow WordPress bloggers were overwhelmingly positive. My Take: I greatly enjoyed Aurora even if I found myself disagreeing with much of it. Some of the philosophical stances KSR takes (or seems to take) are unexpected, and by the time we reach the final sequence of the novel, an ecological sublime with a character swimming in the ocean, he’s made a powerful argument about the absolute value of the self. Don’t know if I buy it, but the fun of this novel is in thinking about the ideas. In that way, Aurora does much the same work as Seveneves, using a SF canvas to probe complex ideas of the relationship between identity and scientific knowledge. Reading Stephenson’s novel and then reading Robinson’s was the best new SFF reading experience I’ve had so far this year, even if I liked Stephenson more. 9.0. So, what’s your take? Will we see Aurora on the ballots next year? At some point you should examine the activity on the Sad Puppies 4 recommendation threads and incorporate that into your forecasts. Not saying when you should factor it in, but more than a hundred novel nominations have been recommended. I am recommending this website and Eric Flint’s blog. Don’t worry, I will—but probably when I get to my prediction pages. My goal is to do this in early November; I’ll list my Top 1-15 Hugo novels, and I’ll try to take into account what I think will happen with campaigns. Should be interesting! I recommended both you and Eric Flint on the Sad Puppies 4 website for Best Fan Writer. Another person nominated you before I seconded their nomination. My nomination of Eric Flint with my rationale is pending moderation and should be posted soon. If you do not wish to be considered by the Sad Puppies 4 group you should consider requesting that your name not be under consideration.